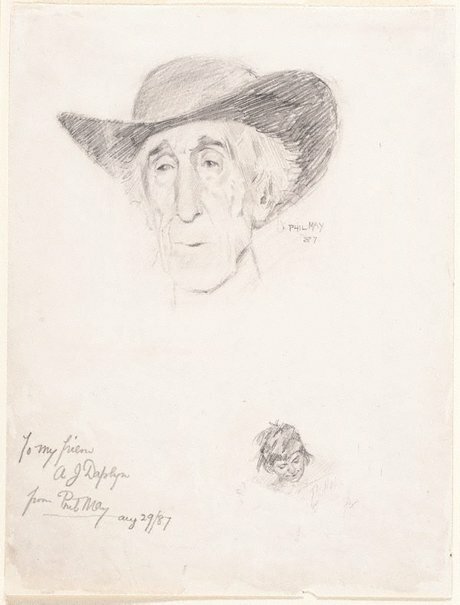 A J Daplyn (1844-1926), to whom Phil May dedicated this drawing, was the first art instructor at the Royal Art Society School, Sydney 1885-92. He encouraged his students to paint en plein air and wrote the influential book 'Landscape painting from nature in Australia' (1902). Among his best known pupils were Charles Conder (1868-1909) and Sydney Long (1871-1955). Signed and dated u.r., pencil "PHIL MAY/ '87". Signed l.l., pencil ".../ .../ ... Phil May [underlined]/ aug 29/87". 19th century Australian watercolours, drawing and pastels from the Gallery's collection , Sydney, 2005, 78, 79 (colour illus.). James R Tyrrell, Old books, old friends, old Sydney: the fascinating reminiscences of a Sydney bookseller , Sydney, 1952, between 36 and 37, 45. A photograph of Phil May and the Reverend J Brophy in Sydney in 1886 is reproduced. National Art Gallery of New South Wales, Catalogue of the National Art Gallery of New South Wales 1917 , Sydney, 1917, 120. cat.no. 33; titled 'Portrait Sketches'; Presented by Mr. Howard Hinton 1916. National Art Gallery of New South Wales, Catalogue of the National Art Gallery of New South Wales 1921 , Sydney, 1921, 143. cat.no. 9; titled 'Sketches'; Presented by Mr. Howard Hinton 1915.